Gloucester loving Jess’ new farm cart, some sweet peas blooming in the prop house and our rows of taters! Two farmers, One farm. In 8 weeks of harvest we’ve distributed over 19,000lbs of produce to our members! All of that produce has been grown thoughtfully and prepped, seeded, transplanted, weeded & harvested by 2 sets of hands (each and every crop was picked fresh a few hours before pick up by farmer Jess or farmer Brian). With the shares getting a touch more bountiful with summer crops, that puts us on track to grow and distribute over 80,000lbs of produce for the Spring/Summer/Fall season! The summer crops are a growin’! We can’t believe how many flowers there are out in the tomato patch. We’ve never seen so many before! Even our determinant varieties of tomatoes are giant and loaded with flowers/soon to be fruit. The winter squash plants are running and so are the melons. 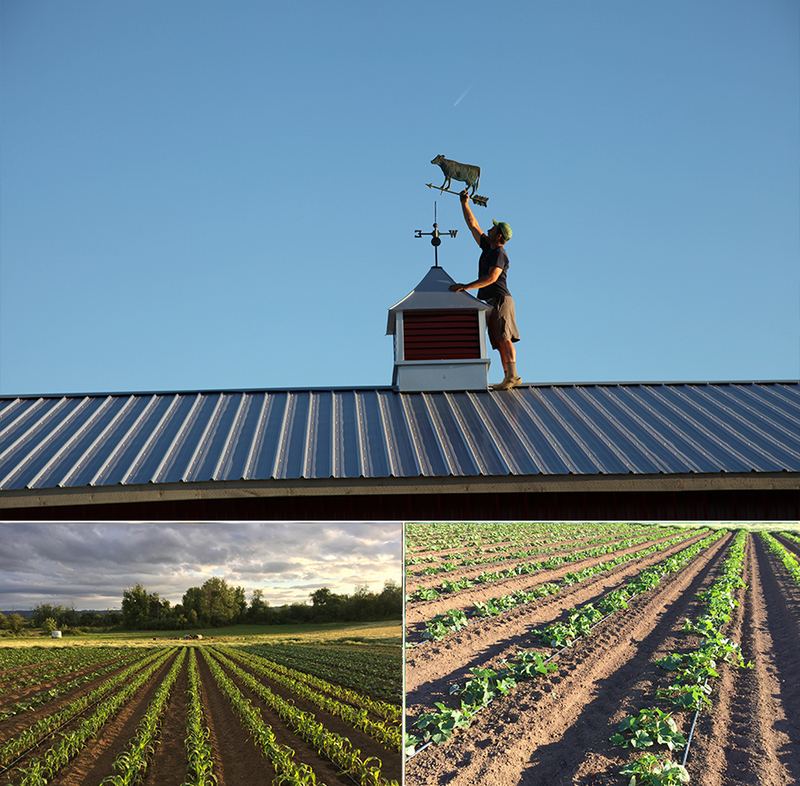 The fall crops are just a few weeks away from being planted… fall broccoli, kale, collards, romanesco, cauliflower and cabbage. Over 10,000 plants! Over the next few days we’ll be seed starting over 18,000 more plants for Fall. And then another 10,000+ for winter in the next few weeks. One of our smartest investments this season was a vacuum seeder by berry seeder http://www.berryseeder.com. In 15 minutes I can now seed 15 trays which means in a few hours I can get done what would normally take me a few days or one really looooong day spent in the greenhouse. It makes a huge difference on my back (no hunching over trays), feet (less time standing in one place for hours on end) and my attention span (repetition, repetition, repetition)! The flower loaded tomatoes, the first cherries are ripening and our daily/evening date night trellising in the tomato patch..
We spent a fair amount of work hours weeding this past weekend. We weeded our second succession of cucumbers, squash, celery, celeriac and parsley. As well as the basil and peppers! We planted out the brussel sprouts for winter CSA, leeks, another round of lettuce, cutting celery, our last succession of sweet corn and a few other random crops. We also seeded our fall and winter carrots into some extra weedy beds using our pre emergence flame weeding method (see: newsletter week 6) We’ll begin flaming them tonight before the carrots emerge in the next few days! Hopefully when they do it will be a pretty and clean seed bed. The babies are growing, first round of chicory, broccoli, kale and some painted corn! We’ll be prepping some major new ground this weekend in preparation for planting in the next few weeks. Liming, fertilizing and composting we will go! As well as transplanting the next succession plantings of cilantro, dill, pac choi, summer squash, zucchini, cucumbers and some painted mountain corn! And, of course, tackling another handful of weeding projects. And trellising those tomatoes… one row at a time…. as soon as we add another line of trellis BAM they need another – they are growing like gangbusters. WHF Online Farmstore. We’ve had some amazing feedback lately from folks regarding our pastured pork. With the coming of summer it’s officially grilling season! We have over 10 different kinds of pastured pork sausages available on the WHF Online Farmstore as well as many other beautiful cuts of pork. We slow cooked some pork shoulder butts over night and had the most amazing pulled pork sandwiches the days to follow. Be sure to check out our farmstore here: http://workinghandsfarmstore.com/collections/all! All orders can be conveniently picked up on your CSA pick up day. Share the link with friends and family and help support our small farm! The very first eggplant, our epic tomato trellises and more cute babies emerge! Have an amazing week & enjoy the bounty! p.s. The weathervane that was given to us for our wedding is finally up on the new barn. Farmer Brian probably picked the windiest evening to do so but she waves strong and proud up there! It looks great!